The Class of 2009 need not worry about getting jobs. Headline-grabbing salaries, though, may become rarer as may sign-on bonuses. Will the slowdown impact recruitment at India’s leading B-schools? A Mumbai-based investment banker, whose company recruits 25-30 MBAs every year (for both international and domestic placements), says: “Slowdown or not, there is still a talent crunch, and there will always be competition for top-flight talent. So, unless things get really bad, recruitments will not be affected,” he says emphatically. Yashovardhan Verma, Head of HR, LG Electronics India Limited (LGEIL), says his company is also keeping recruitment levels steady, and might even increase its intake this year. “You cannot take a shortterm view when recruiting managers. Economic cycles are a reality of life; but even if there is a slowdown, you don’t want to be caught out when the economy takes off again.” LGEIL recruited approximately 45 freshers this year, mainly from B-schools that are not in the Top 10 on this list, and Verma says that the company has a tentative target of recruiting 50 students in the coming academic year. Most recruiters feel the slowdown is a short-term phenomenon and so, are not factoring it into their recruitment calculus. “High inflation and the US subprime crisis are problems today, but we are planning for the future,” says S.Y. Siddiqui, Head of HR, Maruti Suzuki India. The company, which recruits 25 MBA graduates every year, plans to keep recruitment numbers steady in 2009. The story is the same in the retail sector. In our cover story The Retail Wars (BT, June 15), we had mentioned how Big Retail is planning to ramp up operations over the next couple of years. But most retailers do not have even an indicative idea of how many management grads they will pick up. A senior executive at Bharti Retail mentions that retail holds great prospects for B-school graduates, particularly in back-end operations, “The retail sector will be recruiting thousands of people over the coming years, and even though only a small proportion will be managers, there are significant opportunities here,” he says. However, several of HR heads we spoke to admitted that “affordability” is a distinct problem and that the exuberance of the past few years needs to be tempered. “I do not expect salaries to come down, but the huge 25-35 per cent yearon-year increases in offers will stabilise,” says one. “Have our expansion plans slowed down? No. Do we have to tighten our belts? Yes,” says another. That means salaries might get affected. I-banks will not stop hiring the brightest and the best. However, the global financial meltdown means young graduates might be thrown to the lions in case a major I-bank goes under. Don?ft say it can?ft happen; Bear Stearns has already sunk. Demand for talent at consultancy firms will remain high as India Inc. continues to ramp up operations. International placements, though, may see a slight slowdown. 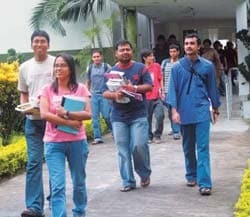 This evergreen sector will continue to draw in large numbers of B-school students. Given the spectre of a slowdown, it is likely that FMCG companies may just seem more attractive from a jobsecurity point of view. Manufacturing has never been the top paymaster, but most manufacturing companies are looking beyond 2009. Since graduates have to go through three-six months of orientation, they may not hit the field till 2010 by when people expect the good times to return. India's telcos are adding eight million subscribers every month; so, they need as many managers as they can find. With more competition expected from new players, expect more demand from this sector. Many of the large retail players may have taken their rapid expansion plans off the boil, but they will be expanding all right. More stores will require more managers for the back-end and to negotiate with suppliers and more. Disposable incomes might be impacted by the rise in inflation, but consumer durables companies are planning for the future and opportunities remain good, though salaries might not be the best. With much of the infotech sector dependent on the US, a slowdown there may result in IT companies not increasing their intake as they have done year after year. However, companies with a strong domestic presence and multinationals will continue to recruit aggressively.